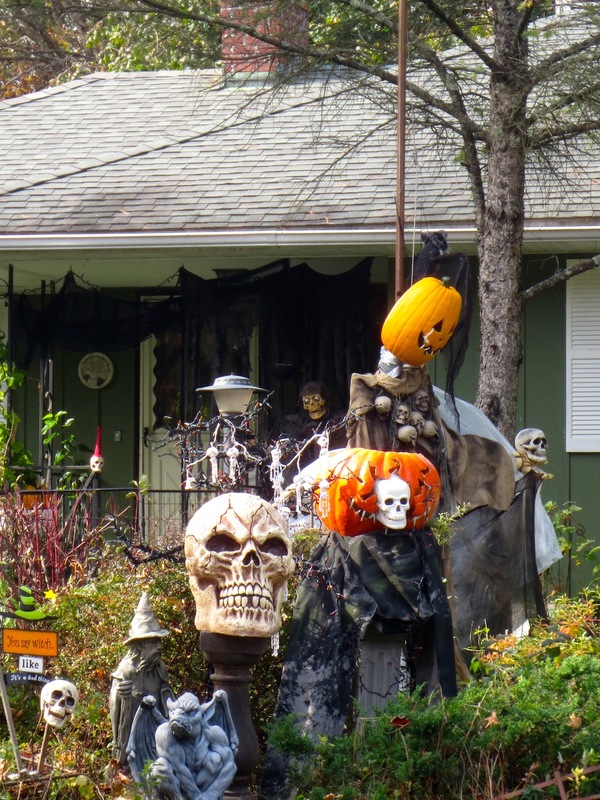 There in one house on Main Street in Germantown that usually grabs most of my attention as Halloween approaches each year where a macabre band of ghouls, goblins and killer clowns swarming along the privet and emerging from the front lawn. This year as October progressed however, no decorations appeared. Initially disappointed, it nonetheless gave the chance to see some of the other quirky, artistic or spooky Halloween decorations gracing other homes nearby. 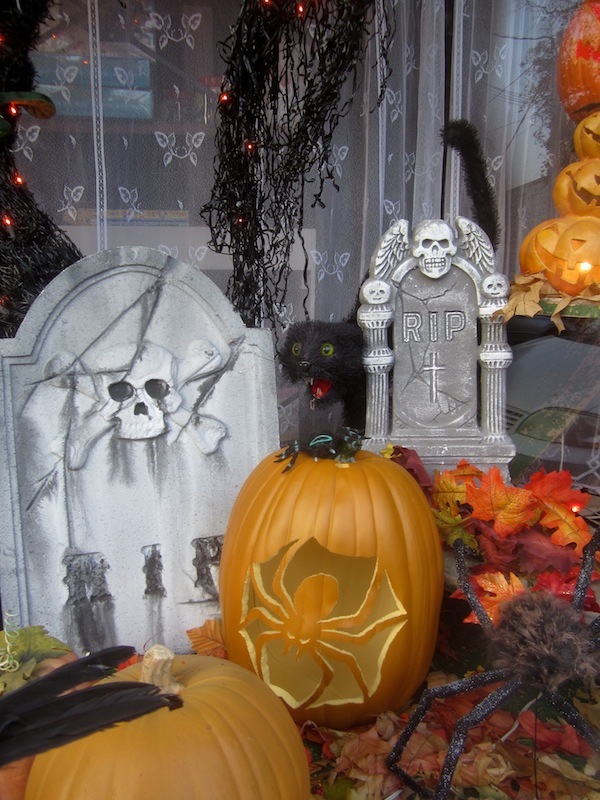 Although there are many different displays in and around town, these are some of my favorites. The first place is located on the right hand side of 9G heading south from town. Set back from the road, you can easily miss it if distracted. However, its worth it slow down and take a look. 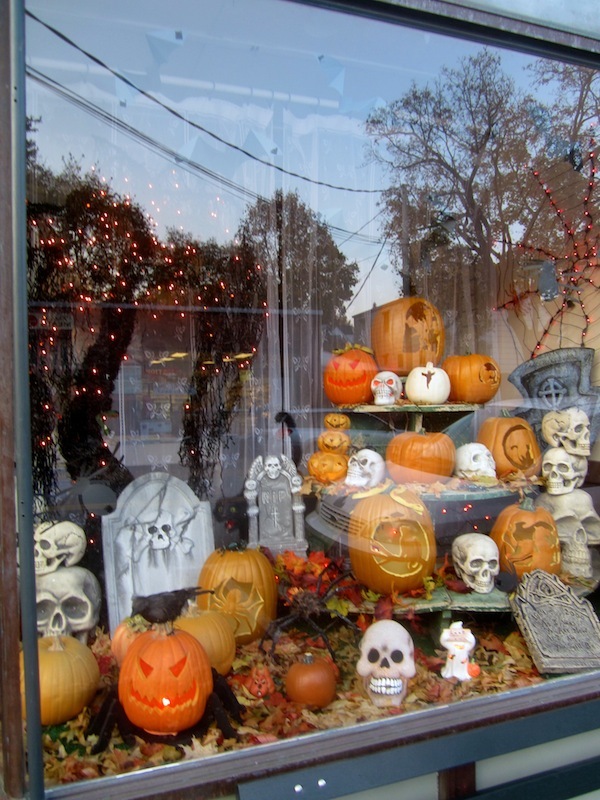 The skulls, troll, and jack o’lantern heads are arranged in a very interesting composition, both attractive and repellant at the same time. A true study in contrasts! Nearby, on Roundtop Road between Route 9G and Woods Road, this display shows both whimsy and humor with ghosts dancing around the lamppost looking as if they are ready to levitate and the graves of Ida B Ware, Pum Kinn, and I M Scarett encourage one to read and linger at the Spookyview Cemetary. Downtown, Floral Innovations and Gift Shoppe on Main Street can always be counted on for an interesting window display as a dog lover, the frightened black cat in the back is my favorite. Last weekend as I drove up Main Street, a crowd was gathered round the house I mentioned at the beginning of the post. They were back, albeit little later than usual. The house was in full on spook mode – bigger and badder than ever! 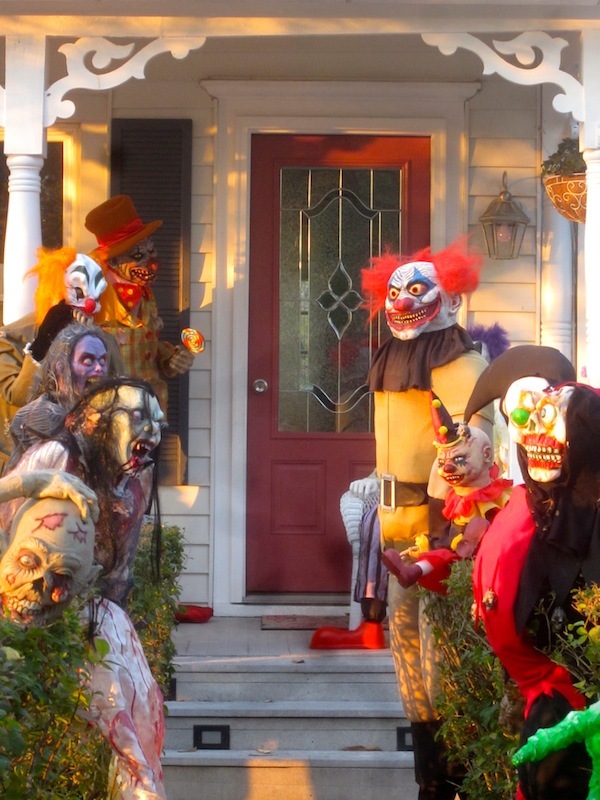 More heinous creatures lined the privet, creating a gauntlet that only the bravest trick or treaters would dare traverse, only to face even more sadistic clowns on the steps I don’t know if any candy would be worth it! This year a new feature is the graveyard overseen by a resident crypt keeper in the side yard. The beings in the yard are so scary, relatively benign ghosts and scarecrows congregate at the house next door. All the homes are interesting in a different way – and worth checking out, if not this year – next!